This procedure is a crucial part in any business who rely on their Refrigeration and/or air conditioning to function but unfortunately through our experience this is the most neglected service and causes the majority of calls through those early summer months. Carried out correctly by our engineers we could reduce you're running costs by as much as 50%. Clean condensers and filters are paramount and need cleaning more often than you think but most are hidden away and forgotten about. Check out our section on procedures and tips. Other major factors are control settings ie;running too cold or continuously running and never switching off possibly caused by a lack of refrigerant. Not only do gas leaks increase you're running costs but most are powerful green house gases. A common refrigerant like R134a has a global warming potential about 1300 times greater than CO2 kilo for kilo. Under the F-gas regulation which came into force on the 4th July 2006 equipment containing 3kg of refrigerant and upwards requires leak testing by law at least every twelve months. Please view our F-gas section to find out if this may apply to you. This is why it is vital to make maintenance a regular activity. The main objective of this regulation is to contain,prevent and thereby reduce emissions of the fluorinated gases covered by the Kyoto protocol.This became effective on the 4th of July 2006. It does impose obligations on operators of Refrigeration and Air conditioning systems. The scale of leak testing depends on the amount of refrigerant present in any one system. this is calculated in kilograms of charge. In brief. Units containing more than 300kg require leakage detection systems being installed these must be inspected once a year. Leaks that are repaired require re-checking within a month to ensure the repair was effective. 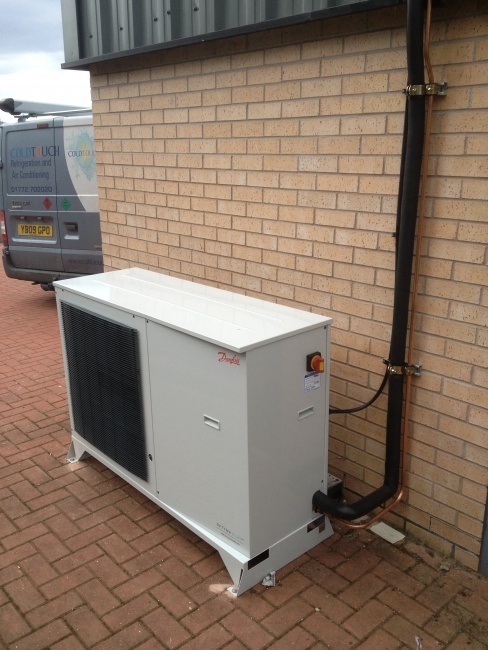 New legislation was brought into place to phase out virgin R22 refrigerant on the 1st of January 2010. Should a gas leak or major fault occur on a system containing R22 then you seriously have to consider your long term options. Please contact us if you require any advice regarding these changes.